Optimize current delivery to targeted brain regions. Optimization of electrode montage for brain targeting and individual subject customization has never been as easy as with Soterix Medical's Neurotargeting software. With recognition that placing an electrode "over" a target does not support rational tDCS dose design, the Soterix Medical suite of software tools allow simple and automatic optimization. Optimized dose can then be used to configure your Soterix tDCS and HD-tDCS stimulator. Soterix Neurotargeting software also provides high-resolution current flow visualization that can be used to support publications, presentations and proposals. Neurotargeting is not neuronavigation. Neuronavigation assists in the placing of electrodes or coils "over" brain regions. Neurotargeting automatically pre-determines the optimal electrode placement based on clinician identified brain targets and subject specific anatomy. 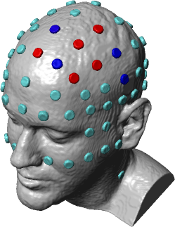 The electrode montage (based on EEG 10/10) parameters can then be programmed into Soterix Medical stimulators to achieve optimal brain current flow. Soterix Medical image processing captures true 1 mm anatomical resolution and cortical folding while custom current-flow optimization provides the precise best configuration. Neurotargeting yields a true optimized stimulation montage and the high-resolution current flow visualization to prove it. Not a coder? No experience with computer modeling? Not a problem. Soterix Medical Neurotargeting software uses a intuitive graphic user interface, and every software has just three easy steps. And Soterix Medical biomedical engineers are available for unlimited hands-on customer support. Because you can’t leverage what you can't use. Don’t be confused by copycat hardware and software that provides neither flexibility nor precision. State-of-the-art neurotargeting software and hardware, with flexibility and precision, exclusively from the industry leader in non-invasive electrical stimulation, brought to you by Soterix Medical. tDCS is a highly versatile and adaptable treatment. Soterix tDCS stimulators and accessories can be simply customized to address a range of clinical needs. An important clinical challenge is the optimization of stimulation protocols, including addressing disease specific and/or patient specific needs. Every Soterix Medical Neurotargeting software is enabled for individual optimization of current flow. Using Soterix Medical solutions, simply upload subject-specific MRIs and the corresponding current flow head model will then appear inside the subject select drop-down menu in your software. It is that easy to consider how variations in your subjects' anatomy may influence current flow. Then combine this with Soterix Medical Neurotargeting to optimize electrode montage. For each of the four stroke subjects below, see how optimized Soterix HD-tDCS dosage delivers current to target regions (black circle) as opposed to conventional stimulation.